It’s almost become a running joke. And you heard it in the pit area on Saturday afternoon. Then, you heard something that was a little odd. That was the sound of Jeff Fultz slapping the wall. 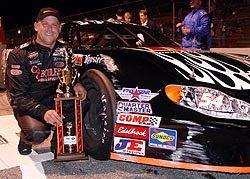 Defending Southeast Series champion Jeff Fultz loves Greenville-Pickens Speedway. 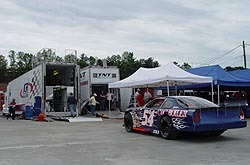 Coming into Saturday night, he’d won the last three Greenville races in a row and should have won the last four had he night been taken out in a late-race accident in the opener at Greenville in 2003.
the backup and old faithful damaged, it looked like the streak might be in jeopardy. But Fultz’s “never-say-quit attitude” is what has gotten him three Greenville wins and, just a few hours later, would get him his fourth-straight. Fultz and the #54 team changed their plans and went to work on the main car, opting to fix it instead of going to the backup. They got the car fixed and back out just before qualifying, clocking in with the second quickest time of the day. 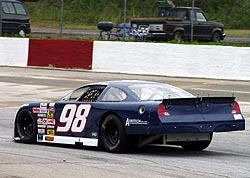 After the redraw, Fultz started seventh. He worked his way up to second behind teammate Kevin Prince. 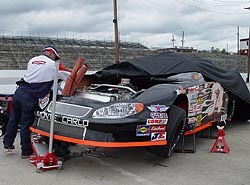 After pitting, he came out second to rival Jason Hogan. Just a few laps later, on lap 58, Fultz found the lead. He would never relinquish it. “I’ve been coming here a lot of years and (the track) just took to the style I like,” said Fultz. “I finally got a car, two years ago, that I really liked here. I always struggled here in the past. We were always fast, but I just couldn’t close the deal. Then, a coupe of years ago Joe Shear Jr. came down here with me and he taught me a lot. He taught me how to drive it more than anything. “Then, my guys have such good cars. Once I found that little thing, we adjusted and have been good ever since. I’ve won with four different setups here; that is what it amazing. With the win, Fultz becomes the all-time winningest driver in SES history at Greenville. Fultz was tied with legendary drivers Jody Ridley, Billy Bigley Jr. and Wayne Anderson with three wins apiece heading into the night. But it looked like, for a while, that Fultz might not get a chance to set himself apart from the field. Behind Fultz, Justin Wakefield did his best to try and catch the Greenville dominator. He stayed with him for a few laps after each restart, but in the end, had to settle for second (after starting 10th), his career best NASCAR Southeast Series finish. “That car was great,” said Wakefield. “The car was very good on long runs. The longer we went, the better and better I thought the car was getting and the more I thought we could catch Fultz. But he is so good, he is hard to beat. “I was just trying to time the restarts right, but he would eventually get me going off into the corners. Hogan, who has often talked about how much he dislikes Greenville, came home third after leading a few laps after the pit stops. Charlie Bradberry returned to the series and finished fourth and polesitter and rookie candidate Gary Helton finished fith. But the night belonged again to Fultz, making him the Jolly Green(ville) Giant. The #98 and Justin Wakefield picked up the best finish of his career. “We broke and hit the wall,” added Fultz, who works for the #77 NASCAR Nextel Cup team during the week. “I thought “oh shoot.” My guys worked hard on getting that car rebuilt rather than using the backup car. I told the guys that we build racecars that go 200 mph, we can rebuild the frame. So the guys worked hard and we gout out there just in time to qualify. “The practice run right before, I was really tight and the car just had a drastic change. We came in and tightened the bar up and went back out and then it broke. The upper mount for the A-arm broke. I just barley touched the wall, but it just destroyed every piece on the right front. It ripped two big old holes in the frame. WE had to plate it, take the old piece that broke off and grind it down. Everyone welded everything up and got it back to where it was. Fultz's crew went to work on the 54 (top) after unloading the backup car (bottom).